When you have a patient who’s just not making progress, it can be terribly frustrating for both practitioner and patient. But a new way of seeing a patient’s problem can unlock what once felt stagnant and stuck. In those discouraging moments, a fresh perspective can be as precious as the discovery of a rare, exquisite, glittering diamond. But how do we get those “a-ha” moments that can make such a difference in our clinical outcomes? Well, the way I see it, one major challenge for us as practitioners is the way we work. You see, so many of us work in isolation. Whether we have a private practice or we work in a busy clinic, when we see our clients, our door is closed. It’s rare that we get opportunities to come together with other practitioners and mine the depths of our collective wisdom, plus hours upon hours of experience in the consulting room. And when we do get those opportunities, it usually involves travel, which takes us away from our families and our clients (not to mention the costs of flights, hotels, etc). But when we do come together, the potential is great. We can get fresh ideas and help each other see blind spots that are impossible to see when working alone. We can share much needed encouragement and get support for the challenges of our work. And we can spark ideas that can make a critical difference in the lives of our patients. In today’s world, the model for achievement is changing. We see fewer great ideas and theories coming out of isolated ivory towers, and a lot more significant contributions happening when a lot of top people come together. I believe the reason we’ve had so many advances in trauma work over the last 5 years is because the top thinkers (researchers and clinicians) have gathered annually in their own self-organized retreat. Those informal, not-open-to-the-public meetings have fostered a synergy of ideas that have taken us to where we are today. What would happen if we came together, too? 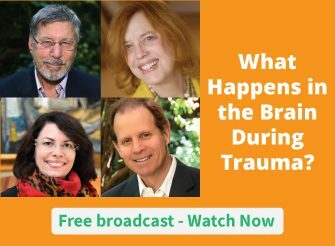 And better yet, if we could do all of this with the expert insights of the world’s leading minds in trauma treatment, mindfulness, and neuroscience, well, there’s no telling what might evolve in our lives and work. We just launched our Next Level Practitioner membership program with people from around the world and across the professions. Practitioners who signed up are coming from 35 different countries, including Argentina, Germany, India, Japan, New Zealand, Russia, and South Africa. There are psychologists, nurses, physicians, occupational therapists, marriage and family therapists, social workers, counselors, dietitians, and other kinds of practitioners. We’ve just closed our doors to new members as we’re about to get underway with the charter member group. But if you’d like to join our waitlist so you’re among the first to know when there’s another opportunity to get in, you can do so right here. And in the meantime, I want to hear from you. What are some of the challenges you face in working alone? Thanks for you article from our website you will get learn that how do i adjust brightness in windows 10 operating system which you will do it online in simple steps. The open-faced refreshments who take chances and live big and smirk with each of their smiles. college assignment service These are the people I aspire to be around. This is the true way I desire to live and enjoy and address. I work with adolescents who have undergone major trauma and this is sometimes difficult to find trainings that are specific to this population and I feel alone. Process Healing by Gary A Flint and Jane W. Wakefield.